Where’s Dr Who when you need him? … feed that kid who plays Merlin a burger? 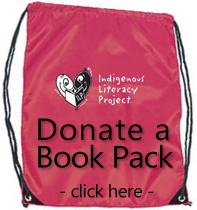 Forego a pair of shoes or two and contribute to the Indigenous Literacy Project – more readers can’t be a bad thing. The Book Buzz project aims to raise literacy levels of young children living in remote communities by recognising the need for early experience and contact with books. Madigan Mine – you want more? April 20, 2010	| News	| Comments Off on Madigan Mine – you want more? When Alex meets Madigan again everything changes. His childhood sweetheart is beautiful and impulsive, but there is something wrong with her. Something dangerous. Now Alex can’t get Madigan out of his head. Is it all in his mind, or is she communicating with him? Yes, space on the bookshelf. Shuffle that beloved, dog-eared copy of Jane Eyre aside … or indeed anything else … coz this is going to totally kick the collective asses of everything on the shelf … so make a little moat around it.